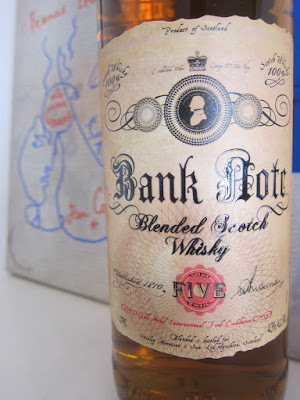 Bank Note 5yo (43.0%): Bank Note is a five year old (extra points for the age statement) blended Scotch whisky from A. D. Rattray's portfolio. The press release says that its recipe contains 40% single malt whiskies sourced from the distilleries in Speyside and Highlands regions and the rest is grain whisky distilled in Lowlands. It is the second whisky from A. D. Rattray line-up I will review after the blended malt called Cask Islay. 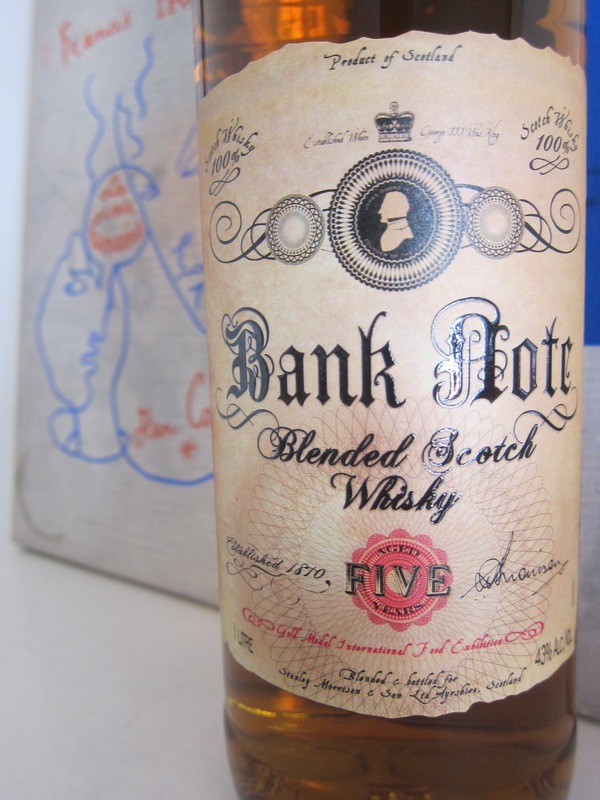 Bank Note is bottled at 43% abv. and the 1 liter bottle sitting on my desk carries a price tag of $19... So, since the whole story is too good to be true, I have to admit that I start the tasting a little skeptical. But anyhow, let's see what the whisky will deliver in the glass... Color: Light amber... Looks like a healthy dose of caramel coloring is involved. Nose: Ok, the first impression I have is something like this: It is early afternoon and you walk into a dive bar right after they open. There is nobody around except the old guy with a trucker hat sipping his beer slowly while watching the news on the local TV channel... Cheap dishwasher liquid, burnt oil smell from the kitchen, bleach on the floor and wet wooden counter tops... You get the picture. What else? Damp concrete sidewalks after a summer downpour, milk paint and moldy hay. Nothing to feel inspired so far... After letting it air a good five minutes I start to get some faint decent aromas: Table grape, unripened peach and green almonds. Breakfast cereal but young grain alcohol is still there and burning its way through. Palate: Well, way more pleasant than the nose. Creamy... Yellow gummi bears, lime juice and candied lemon peel. Too bad that the dishwasher liquid is still there. Some candle wax and young alcohol sizzling at either side of the tongue. Finish: Sudden death. Mostly with alcohol burn... Some artificial lemon extract and caramel sweetness. Overall: Well, let's get it straight: Nobody promised anything more than a five year old $19 whisky... And that's exactly what it is: A whisky you would get when you shout "Whisky..!" after entering a pub. And believe me, it might pair ok with your pint of ale you are ordering with if it is pretty late in the night, but that's about it. It also can make decent highballs. I have to say that the nose reminded me a lot of Whyte & Mackay Special and that's why it threw me off mostly but I have a liter bottle now in my cabinet and I better find a way to make it work. Summer is almost here and I am sure that I will be drinking a lot of whisky highballs in coming months. So, there you go... Long story short, Bank Note won't make the list. There are many other blends to purchase if you are willing to pay a few bucks more.